Sophomore utility player Sierra Lange throws a pitch during Saturday's game against Saint Louis. Softball is just four wins away from owning the program’s winningest record – and the team still has 14 games remaining to meet the mark. Following a three-game sweep against Atlantic 10 rival Saint Louis this weekend, the Colonials (30–11, 6–3 A-10) jumped to third place in conference standings after entering the weekend in the sixth slot. The series sweep marked the team’s 30th win of the season and is just the second time in program history GW has hit the 30-win threshold. Softball has tallied a winning record just four times since 2002 – staying in the green in 2013, 2015, 2017 and 2018. With a current win percentage of .732, the team is also on pace to surpass the program-best 33 wins it earned last season. The Colonials have not slowed down after a hot start to the season under their first-year head coach. The Colonials are leading the A-10 in every major offensive category including hits, runs, runs batted in and batting average. But Winkler said the Colonials are more focused on winning conference games and competing for a championship than holding the wins record. “We got the toughest first four weeks of anyone in the conference so we knew if we could get through the first four weekends close to the top, we were going to be in good shape,” he said. GW’s first four weeks of conference play included two series against top A-10 rivals Saint Joseph’s and Fordham, who hold conference records of 7–2 and 6–3, respectively. The Colonials dropped two of three games to Fordham but bested Saint Joseph’s by winning two out of three games in that series. After winning both games of the team’s doubleheader against Delaware State Wednesday, sophomore infielder Alessandra Ponce said the team has carried a “championship mentality” into each game since the start of the season, which has led to continued success. “For us, every game matters, every pitch matters, every inning matters and treating everything like game day like coach says has put us in a really good mindset this season, and that’s why we’ve had a lot of success,” Ponce said. She added that the Colonials’ “scary” offense has also affected the way they structure their lineup and the way opponents prepare to face them. “It doesn’t matter what inning we’re in, it doesn’t matter where we’re at in the lineup, anything is possible for us, and I think everybody else knows that,” she said. 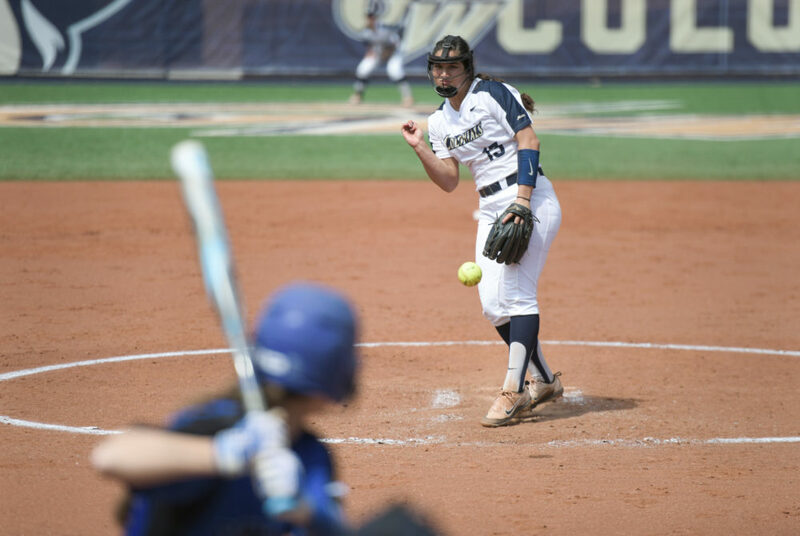 Freshman pitcher Megan Osterhaus – after pitching three shutout innings Wednesday – said GW’s mental toughness will be the key to success the rest of the season. Winkler said the team has instilled a “tougher mentality” since he first arrived this season, which, along with the squad’s combination of talent, preparation and “win-now” approach, will help the team compete for a championship. Winkler said the Colonials must be “tougher” in the infield and not give away at-bats. The Colonials return to action next weekend on the road with a three-game series against A-10 rival Massachusetts, which includes a Saturday doubleheader beginning at noon.